Jan Vanriet’s “Closing Time” show is about exactly that. The Koninklijk Museum in Antwerp, Belgium is closing for a few years to undergo major renovations. Antwerp is a smallish city that can easily be overlooked, in art as in other things, in favor of nearby cities like Brussels and Amsterdam. But as a fine arts museum, the Koninklijk is a heavy hitter. 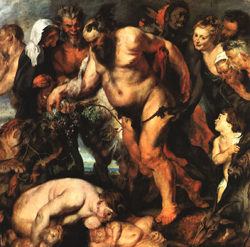 Antwerp was home to Peter Paul Rubens, for instance, and a number of his more famous baroque canvases hang at the museum. Indeed, they have one of my favorites, “The Adoration of the Magi,” in which the Magi seem genuinely freaked out by the appearance of the Christ Child. You can also, at the Koninklijk, see paintings like Jean Fouquet’s Madonna surrounded by Seraphim and Cherubim from the mid-15th century. It is a painting so strange and intriguing I hesitate to describe it. Suffice it to say that the Madonna looks like a blasé runway model and the cherubim and seraphim, painted in deep red, look more like devil babies with the faces of old men. With all these great and famous paintings, the Koninklijk is as stately and serious as any European fine arts museum. “Closing Time.” Through October 3. The Koninklijk Museum, Antwerp. It is, then, all the more surprising that the Koninklijk has given Jan Vanriet, a contemporary Flemish artist, such free rein with the masterworks for their final show before closing. Vanriet is something of a local hero. He was born in Antwerp and has represented Belgium at a number of biennales. The museum told Vanriet, essentially, do what you like. Vanriet took the opportunity to juxtapose his own work with the entire history of Northern European painting contained in the museum. It is a ballsy vanity project on a massive scale. Praise Jan Vanriet all you will; there are few who would rank him with Rubens and Van Dyck. There aren’t many people outside of Flanders who have ever heard of him. But there he is, hanging one of his unframed watercolors alongside a Titian. This pleases me. The show (artistic merits aside) is to be praised for the simple fact that it is a bold and exciting thing for a major art museum to do. Far away suns will be born and expire, galaxies will make new paths through the Milky Way before the Metropolitan Museum of Art in New York City would ever dream of doing something like “Closing Time.” The Met won’t even let you sit down in the Roof Garden. It takes a little while to figure out that what Vanriet is doing is much more, however, than a simple vanity project. 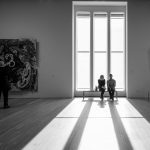 Once you do, each room of the museum becomes its own aesthetic puzzle and solution. 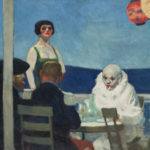 Vanriet organizes each of the 20 rooms around a theme, always including one or more of his own paintings alongside others in the museum’s collection. My favorite is Room V, which Vanriet titles “Prelate”. The title is easy enough to explain. The room is defined by two paintings of prelates — one from the Roman Catholic Church and one from the Eastern Orthodox Church. But the room has little to do with religion. It is about black and green. The central importance of the religious paintings shown in the “Prelate” room is that the prelates are wearing green and black. There is nothing bolder or more satisfying than a block of green set next to a block of black. From a purely visual perspective, the black really brings out the force of the green. Vanriet is well aware of this and has placed his own painting, “Libération,” in the middle of the room, flanked by the religious paintings. “Libération” is a study in green and black, with a wisp of blue in the middle. There is a block of deep green on the left, and a block of pure black on the right. As a study in form and color, the presence of Vanriet’s painting forces you to really look at the religious, figurative paintings in terms of pure color as well. It forces you to see color as the painter sees it. Look at that green and that black, Vanriet is saying, and look at how the power and meaning of the content of these paintings is only possible because of how green and black structure the space and the mood. 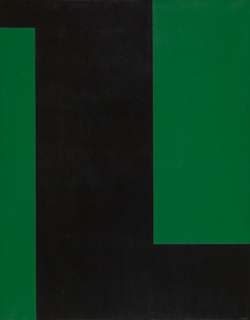 To drive the point home, Vanriet also includes Amédée Crotier’s painting from 1970, “Green/Black.” “Green/Black” is another study in the juxtaposition of blocks of green and black, except that the block of black is in the form of an “L” slashing through the painting. The movement is the key. Not only is Vanriet showing us the way that figurative paintings can be looked at with a formal eye, he is also showing us that abstract works have their own sense of movement and life. The blue also introduces a horizon, the lighter blue of the sky above the deeper blue of the water. Moving around the room, Vanriet goes with that blue, showing us the way that flavors of blue can divide a canvas just as blue divides the horizon in our own visual experience of the world. If the green and the black are a kind of mythic symbolic division of the world into the primal juxtaposition of life (green) and death (black), the blue shows us basic elemental divisions within the world; up and down, air and water. Finally, the human figure emerges, naked and vulnerable against the background of sea and sky. On the final wall, Vanriet includes a couple of Renaissance nudes and his own painting of the female form in front of the blues of the natural world. Green and black in its purity has thus taken us, from one side of the room to the other, all the way to the fragility of the human body.